Boasting an unmatched company portfolio, this company is driven to re-think how their clients manage productivity. 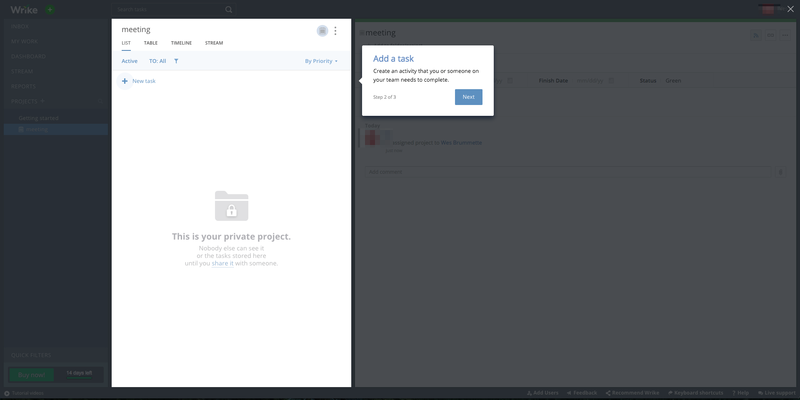 Wrike has created a space that is focused on status updates on projects, resource allocation, and group communication. Wrike has it all. This powerful application covers its bases with a focus on communication and progress analysis. Users of this app are die-hard, and to us, a strong community proves the platform is reliable and well-maintained. Well priced, this SaaS is an excellent choice. With a feature set that most competitors are unable to match, Wrike only has a few drawbacks. The layout of this tool is not very pretty, and some basic functions can be unnecessarily complicated to find. We believe good design is heavily dependent on matching user intuition. This is the only area where the platform is truly not up to speed with competitors such as ClickUp or Asana. Clients are going to be spending a lot of time with their task management program so we feel it needs to be pleasing to the eyes. If this downside is not of concern to you, check out their demo and browse their solid reporting features, communication tools, and project organization. Upon first logging into Wrike, you will immediately be shown a professional, clear video and initialization tutorial demonstrating the purpose of the app. The app’s layout is simple and easy to navigate initially, however, we found that as we added more projects, tasks, subtasks, and users, it became difficult to recall where or how to find everything. They have included almost every feature we were looking for, but the app could use an intuitive redesign. We were very impressed with the activity streams Wrike offers. They have multiple views including list, table, timeline (Gantt), timelog, and workload. These are all automatically created by the app itself. Once enough data is gained, Wrike will even provide you with user analytics. The internal chat is also very well organized and simple to use. 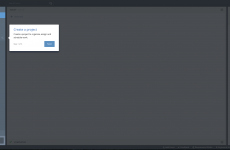 Wrike does like to bother you with pop-ups and notifications that were unimportant to us. We are not fans of paying for a service that still clutters your workspace with anything unnecessary. This tool has very comparable pricing for what you are getting. Though the app is on the expensive side of the spectrum, we believe the features and support you receive are worth the extra cost. Every pricing option includes unlimited projects, who doesn’t like unlimited projects? Wrike boasts a feature-rich environment for an enterprise-grade company. This app is secure, reliable, and safe. Pricing is well-set. Wrike is awesome! I was a longtime Asana user, but found that Wrike had all the missing features that was frustrating me with asana, namely some structure. 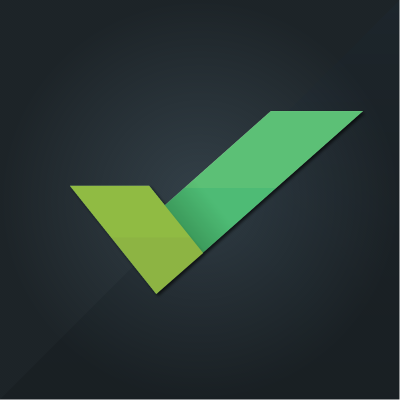 + PROS: Makes managing tasks easy. Love the timeline feature that lets you connect different tasks together. - CONS: Pricing can get kinda high when using Enterprise.It takes so long for a company to adopt this program and use it to its full potential. + PROS: Enhanced communication within our team. Cool feature that allows users to suggest new ideas. Easy to integrate with other tools. - CONS: Could have more customization options. Pricing. Flexibility. Wrike in itself is a strong tool, but there is definitely room for improvement. To be such a big company I expected a better design and overall customer experience. Not happy with how their customer service team talked down to me when I asked a few questions. + PROS: Very Straightforward. Decently easy to use. Very reliable whereas Wrike is a large company. - CONS: Customer service is rude. The UI looks very basic and plain. Other than that not too bad. As we become more and more acquainted with this tool we are liking it more and more. It just takes time. 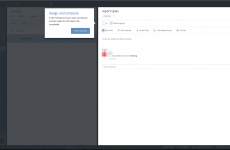 Wrike is great for planning out projects and creating all of the associated tasks and milestones. 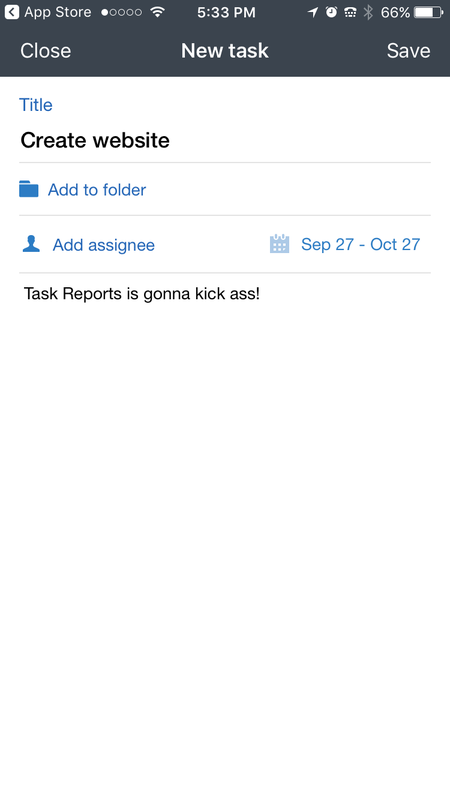 + PROS: Descriptions in the tasks make it easy to keep everything in one place. Separate dashboards for different team members. - CONS: Wrike's customer service can take forever to get in touch with. It seems it can take a full week just to get one question answered. 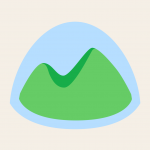 Images and tables that are uploaded within often get distorted. It really helped my team to start a new way of collaborating and improved our delivery time. Additionally, it has reduced the meeting hours spent to check project updates. 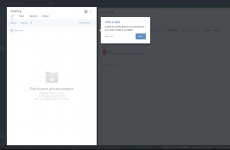 + PROS: I really like that within Wrike, you can create a project, and multiple sub-tasks within that project. I really like the timeline feature as well. - CONS: There can sometimes be a steep learning curve. I find it hard to locate certain tasks if they have been moved or marked inactive or some other label by teammates. A lot of options are offered which creates a TON of confusion for people that are not as familiar with PM software. The mobile app's usability is very bad. We just recently got Wrike and really like the clean UI. However, the live editing feature can sometimes create confusion with our team as it causes movement across the screen. I also wish they had a little bit more customization options available. Overall, a pretty good tool to use for management of multiple projects. I completely agree with you about the live editing issue and wanting customization options. We’ve been using Wrike for a little over two years and it’s been able to get the job done. As more tools become available with better customization and flexibility we have been starting to rethink our software. May have to start the demo process all over again. We love the transparency of it! We know what everyone is working on and the status on our projects. We can report on our work and quickly make adjustments to the backlog when needed. There are some buggy things we’ve found with how projects are sorted. It doesn’t cause a major stoppage but is more of an annoyance. If you don’t do the training up front or keep up with updates you can easily get lost. It has helped us to become more efficient and more productive. + PROS: Customized reporting options, Ability to create custom folders and other set up features, Easy to use, easy to communicate with others. - CONS: I wish we could pay incrementally for users above 5, rather than having to jump to the next level when we only need access for a single additional user. Can get expensive. Wrike is a great tool for our marketing department. It is easy to use, easy to train and user-friendly. 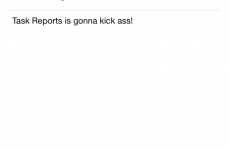 Reporting is a great feature that we use regularly. Everyone on our team knows exactly what tasks/projects they are to complete each day with the use of Wrike. The team is also held accountable for deadlines. With wrike, we are able to communicate to the department on each task. We are able to report to the field the amount of work we have completed within certain timeframes. The only thing I wish Wrike could improve on is automation and calendar views. The calendars would be very helpful if they were actually configurable and printer friendly. - CONS: Calendar function could use some tweaking, and recurring tasks could use some help as well when it comes to updating the recurrence. This software can help streamline efficiency, however, still a lot that the platform is lacking. They really need to improve the training tutorials as it takes forever to get acclimated with the tool. - CONS: I wish time tracking was easier to use and that time could be modified instead of deleting and starting over. Mobile app could use some improvement. Not sure if the layout font can be changed. + PROS: Gantt charts, forms for collaborators to request projects, multiple ways to see and complete tasks, color coding, customizable work flows. - CONS: You cannot undo or change assigned due date, limited integration list, mobile app is not good, UI could definitely be improved. It has really helped us track our projects better. 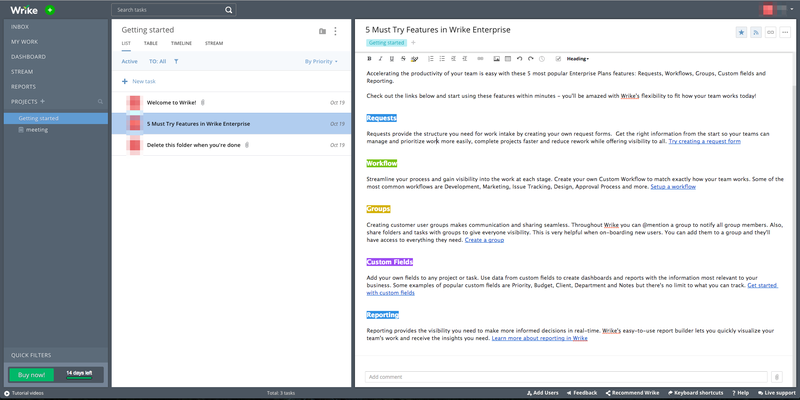 For an immediate solution to project management and collaboration, Wrike is an excellent choice. + PROS: Useful Features like: organizing, assigning, and tracking tasks. Easy to use and well-designed interface. Very regularly updated, impeccable customer support, gannt charts, infinite subtasks, revision history for files. Can’t make workspaces publicly viewable (you can export an interactive snapshot of your timeline though). Expensive if you want all the features. Hard to get even a small non profit discount. Thinking about looking for other options, Wrike is really pricey and the UI is not good. + PROS: has great options for the dashboard where each team member can spend most of their time. 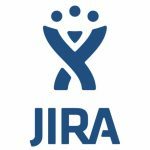 It enables us to easily kick projects back and forth to other members and have it all documented. - CONS: Wrike can be a little tricky to get used to using at first, but this is true of any new software. It would be nice to have the capability to make tasks private to only you and not the team. The timeline view has been helpful for managing schedules. I like that you can create a snapshot of the timeline to be able to share among coworkers without them having to sign into Wrike. It was hard for me to wrap my head around how to setup projects initially. I did a lot of trial and error before I found a way that works for me. + PROS: I like that you can set a complete list of tasks for a certain project and add deadlines to them. Then, if a deadline shifts, you can change one deadline and it moves back deadlines for the rest of the project in one shot. I also like that you can easily assign tasks to people. - CONS: The notifications system infuriates me. WAY TOO MANY!!! 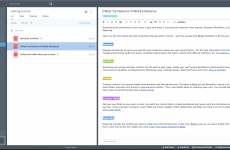 Wrike is a great project management tool. User-friendly, it allows everyone in our team to know which tasks are to complete. It does not take a lot to learn your way through it, it is actually very easy to get around. They have many different features which help us staying connected and on the same page, even though our team is big and it would be very complex to keep it so organized when we have so many different e-mails and information to look into, but Wrike makes it very easy! + PROS: Wrike is so fundamental to our company that we cannot function properly without it. Organization is very important when you have a big team, and Wrike is what keeps us organized. 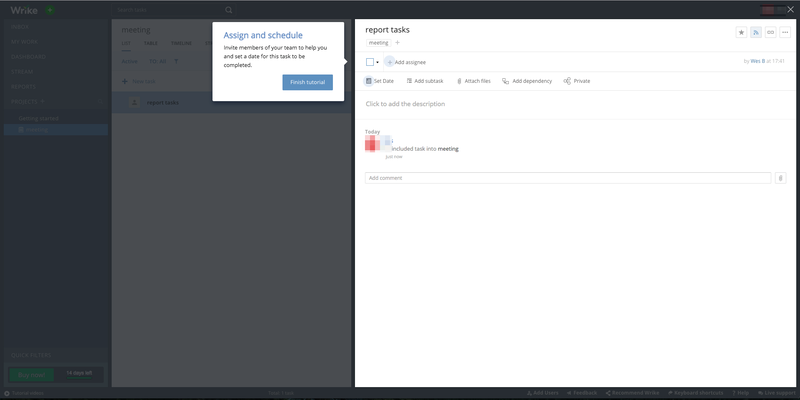 Ability to move projects into folders, save meeting notes, create new tasks and dependent taks (which are connected tasks), keep track of hours, and the most important is how Wrike is flexible. They are always adding new stuff which is pretty amazing. - CONS: I would find it very nice if they added a feature where it would be possible to know who edit each part of a project. Also if they could improve the calendar views. Anyways, I do like the way Wrike is right now and find it to be a software that would fit any type of business. My organization uses wrike. Overall, those who use it daily are happy with it. My branch uses it almost exclusively for project planning, which has a nice interface. A great platform with many useful functions for teams of all sizes. 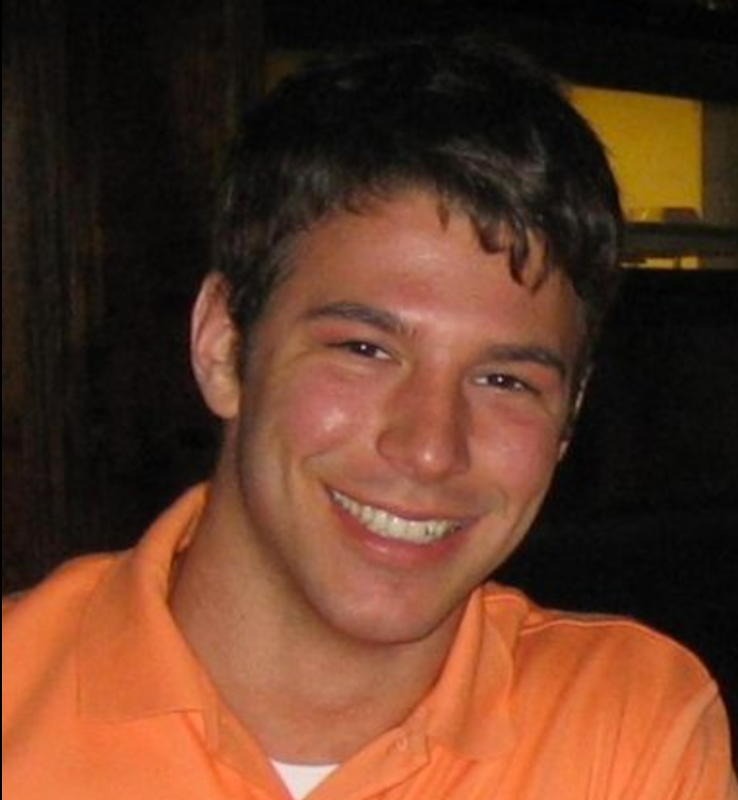 + PROS: The platform has task magamenet as well as scheduling and collaboration tools. Got to admin a couple of big projects and it has been really helpful for keeping me on track of my teams. 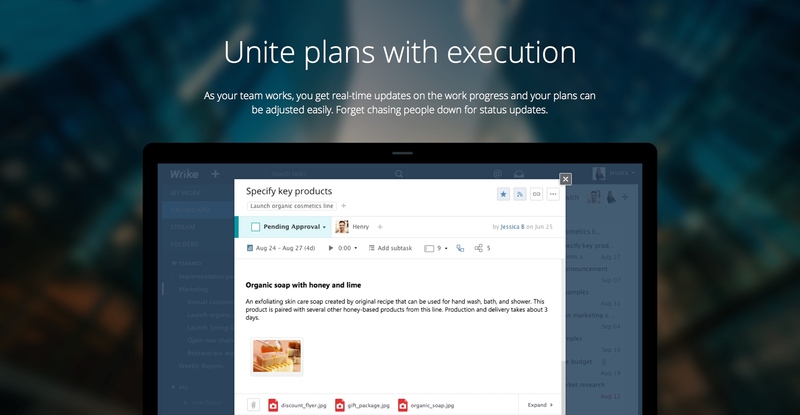 + PROS: Great for keeping track of multiple projects with multiple teams. - CONS: I found it to be a little overwhelming on the day to day work. Versatile features and solutions but not very user-friendly. Dashboard is clean and easy to understand; mobile app is a “must have”, workflow is great; calendar management is fantastic; security options are good. Sometimes loading takes too much! + PROS: The main advantage of Wrike is the minimalism. This is especially noticeable when you switch to this software from other systems. Great for organizing projects and project tasks and discussing one the tasks. The software is meant for collaborative work. Some of the features are hard to learn to utilize because there are so many of them. Still learning. I can track daily work and reference past projects by job number. + PROS: I like that I can see how busy our team is and who has projects on the go as well as easily forecast if deadlines will be met. - CONS: I don't like that the lack of automatic communication when a requestors project has been marked complete.